By now, you know that posting on Instagram is essential for your brand. But why are you using it, and how? This year, we will be monitoring the most engaging brands of Instagram to find just what it is that makes an Instagram campaign a smash hit. Here are January’s results. The best Instagram accounts for January all manipulated the network’s unique capability to visualize a corporate mission. What do you think is the difference in engagement for brands on Instagram versus Twitter? Through sharing product images, glorifying past accomplishments, or using photography or video to share captivating imagery associated with the brand or its industry, the best accounts controlled the conversation around their brand. They crafted a visual iconography that fans could associate with their name, and brought fans into the conversation about what that brand means. In order to do this, they used hashtags – relevantly – to give fans a way to input themselves into this larger vision. Ranked purely by their number of followers, the top brands on Instagram in January were Victoria’s Secret, Nike, and Forever 21, which makes sense – it’s not inconceivable that the pictures people most wanted to see on their Instagram feed were of clothing and beautiful people. Those three brands also took on the most new followers that month. But engagement can happen no matter what your product looks like – the key is to present the most visually engaging idea of what you are. 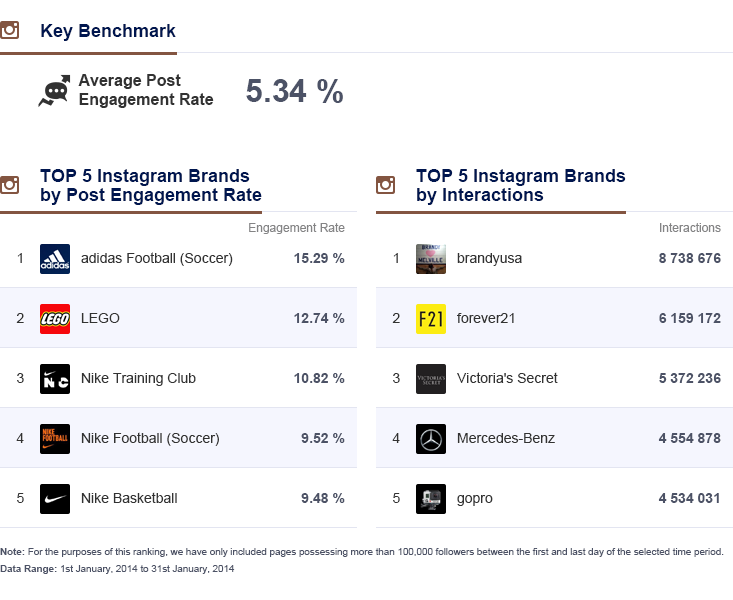 Adidas Football averaged the month’s best engagement rate, which at around 15.3% was nearly a full 10 percentage points better than the average brand’s post’s performance. Adidas’ @adidasfootball campaign is all about building up excitement for this summer’s World Cup. To do that, they have used their Instagram account to post photos of the shoes they are making for the 2014 World Cup in different locations around Brazil, where the competition will take place. In addition to using #WorldCup and #CopaMundial, they repurposed the non-brand hashtag #TBT (that’s Throwback Thursday, for the uninitiated) to get fans talking about past World Cups, and in so doing include Adidas in their conversations. The World Cup is all about national pride, so people will be talking about the event no matter what Adidas does – the challenge for Adidas is to attach their brand to that dialogue. The video they posted is all about Adidas’ colorful presence at this year’s World Cup. Meanwhile, Italian designer of girls clothing Brandy Melville had the most interactions of any brand on Instagram in January. Each of their 115 posts features their product and the hashtag #brandyusa, forming a cohesive marketing campaign aimed at raising awareness for the opening of a NYC branch. Unlike Adidas, which was trying to intensify a conversation, Brandy Melville’s campaign was more immediate – the NYC branch was opening imminently, and more US locations were set to follow in a matter of weeks, so their aim was to create a general image defining Brandy Melville for a new market. Meanwhile, the best individual posts were owned by GoPro, Victoria’s Secret, and Nike. Each visualized the brand’s product or showcased a unique aspect of the product. They all used at least one hashtag to name the cohesive campaign of which the post was a part. GoPro’s post is, of course, shot from a GoPro camera, and continues a series of kayaking photographs they center with #paddle, and, more generally, #gopro. Victoria’s Secret’s is from a distinct campaign, #AngelGetaways, that not only features new products and recognizable models, but through the hashtag allows fans to again mimic the visualized brand qualities, which are health and balance (literally – she is shown balancing a healthy fruit, implying the idea of balanced nutrition), beauty, and those ideas’ connections to exotic locales like St. Tropez, where the photograph was taken. But while Victoria’s Secret is running several hashtag-driven campaigns of which #AngelGetaways is just one, Nike’s top post focuses in on one elongated campaign. Their slogan JUST DO IT has been ubiquitous since 1988, but as a hashtag, its meaning is variable. This post is the first in a year long #justdoit campaign, which is all about encouraging people to just do one tough thing each day, 365 days of the year, and features photos from around the world embodying this ideal. It is intrinsically engaging because fans are encouraged to mimic the behavior showcased in the ads and then submit pictures or video of themselves to potentially appear on the company’s instagram feed. The hashtag creates a forum for fans to take part in building the Nike brand, and in the process associate themselves with the company and its visualized mission. Hashtags are invaluable… to a point. In fact, posts that used hashtags had an average engagement rate of 5.31%, while posts that did not averaged an engagement rate of only 2.95%. While all the best campaigns made use of hashtags, engagement rates dropped by more than 50% if there were more than 10 hashtags per post. This does not mean that including 10, or 20, or 100 relevant hashtags would not aid a campaign – it just means that every hashtag you use should further your goal of making your campaign easy to find and engage with for fans. Social campaigns are all about starting discussions and leading them gently, allowing fans to feel they have a hand in shaping the brand itself. Using hashtags to ground campaigns in visualized ideas, provide some guidance as to what these ideas looks like, and then allow fans to grow the reach of these ideas is the optimal way to do this. But if you use too many irrelevant hashtags, you spread your campaign too thin and fans lose interest. It is better to be defined by several strong ideas, denoted as hashtags and made tangible by images or video, than to try to be defined by too many. It dilutes the power of the idea of your brand that you are trying to cultivate. 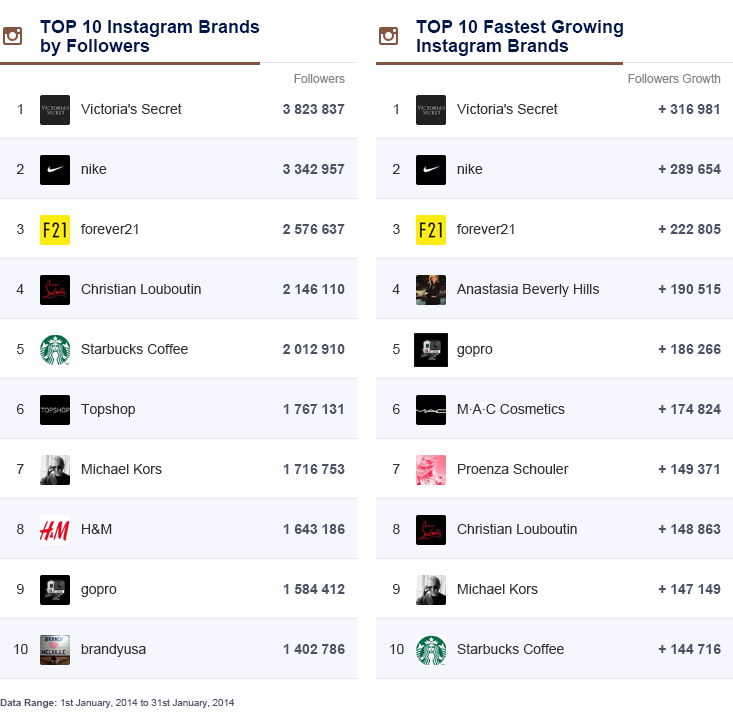 The best brands on Instagram followed these patterns in January – will your brand be among next month’s winners? Check back soon for an updated report with February’s data, as we continue to track the progress of the best of Instagram. Facebook Reactions have been a hit with audiences ever since their first debut. But do you know how are they being used across the world? We took a closer look at data to find out. Learn how countries in Latin America are getting the most out of Facebook Reactions in this in-depth infographic. Thanks to the introduction of Facebook Reactions, users have a variety of different ways they can express themselves. But do all countries use these reactions the same, or are there some differences? We used Socialbakers data to find out!